As the long boom of post–World War II economic expansion spread across the globe, dreams of white picket fences, democratic ideals, and endless opportunities flourished within the United States. Middle America experienced a period of affluent stability built upon a modern age of industrialization. Yet for the people of Appalachia, this new era brought economic, social, and environmental devastation, preventing many from realizing the American Dream. Some families suffered in silence; some joined a mass exodus from the mountains; while others, trapped by unemployment, poverty, illness, and injury became dependent upon welfare. As the one state most completely Appalachian, West Virginia symbolized the region’s dilemma, even as it provided much of the labor and natural resources that fueled the nation’s prosperity. 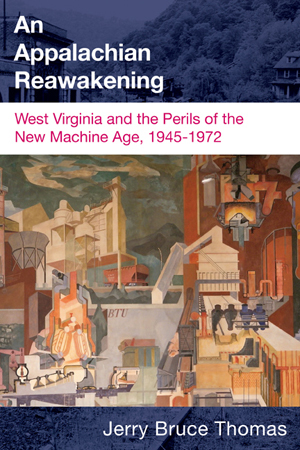 An Appalachian Reawakening: West Virginia and the Perils of the New Machine Age, 1945–1972 recounts the difficulties the state of West Virginia faced during the post–World War II period. While documenting this turmoil, this valuable analysis also traces the efforts of the New Frontier and Great Society programs, which stimulated maximum feasible participation and led to the ultimate rise of grass roots activities and organizations that improved life and labor in the region and undermined the notion of Appalachian fatalism. Jerry Bruce Thomas is professor emeritus of history at Shepherd University, Shepherdstown, WV.